We’re back with part 12 of Overheard in Product—a series where we round up all of the tantalizing conversations from product folks that you may have missed on the web last week. This week, we talk about alternate career paths, designing design, single-tasking, debate, and cartoons that are out-of-this-world adorable. 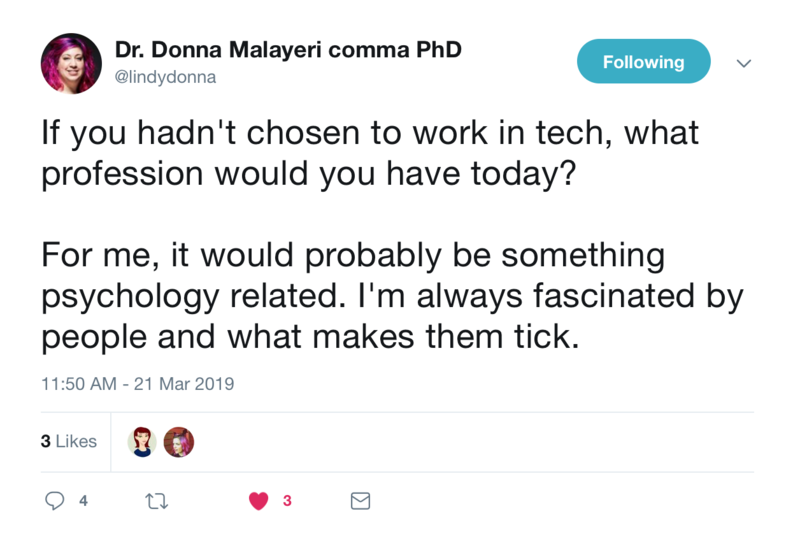 Dr. Donna Malayeri, Product Manager of Serverless at Google, prompted folks to talk about what their career paths might have looked like without tech. People were across the board with their answers, but archaeology was surprisingly popular. Food for thought: What would you do? What things about that job interest you, and how can you practice them more in your current job? 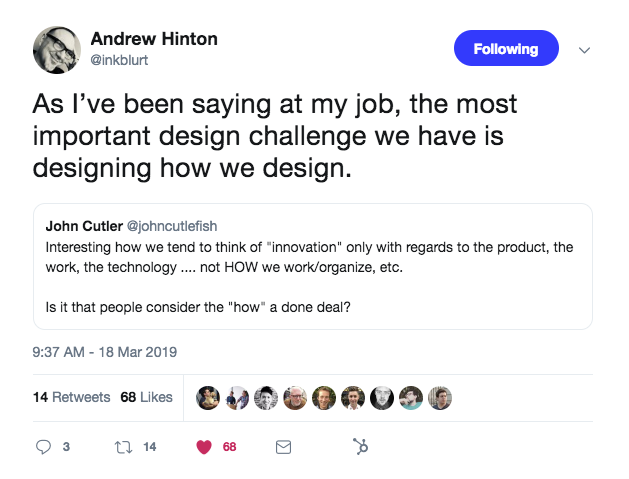 Andrew Hinton, Senior Digital Experience Architect at State Farm, brought up an incredible point about turning your design skills inward toward the company. Food for thought: If you were to design the ideal workflow at your company, what would it look like? What would your design process be? 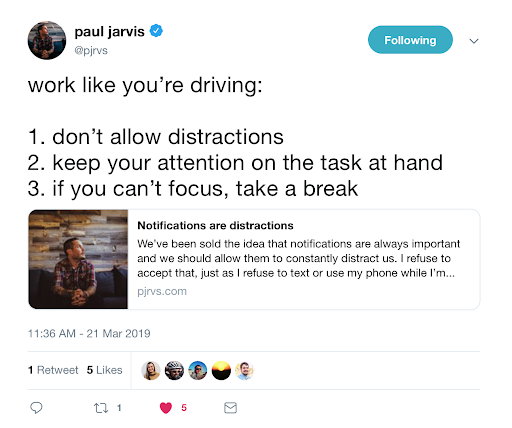 Paul Jarvis, author of Company of One, had an interesting metaphor for getting into deep work. In his full article, he dives deeper into the value of “single-tasking”—the opposite of multi-tasking. Food for thought: Take time to audit how you’re working today. Can you set yourself up for success by making it easier to single-task? 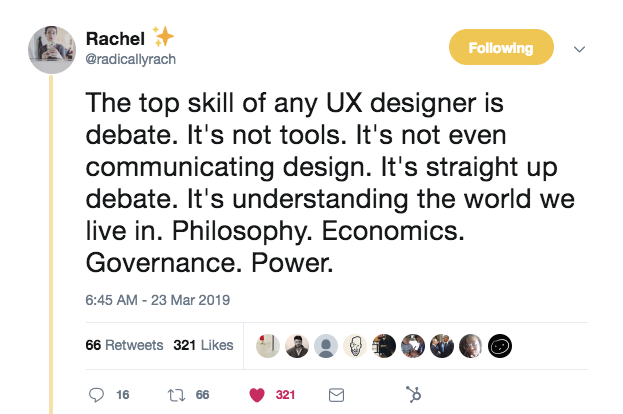 Rachel Grossman, Experience Designer at Publicis Sapient, drew a strong line in the sand around the most valuable skill for a UX designer to have. Food for thought: Has your product team debated lately? How can you embed debate in your product process? If you need a smile (or even just a pit stop, in the words of Paul Jarvis), look no further than Nathan Pyle’s hysterical cartoon series Strange Planet. His funny alien beings poke fun at the everyday things we take for granted—like taking care of indoor plants, listening to sad songs, and cat ownership. And now that it’s officially spring, and I too am craving some star damage.